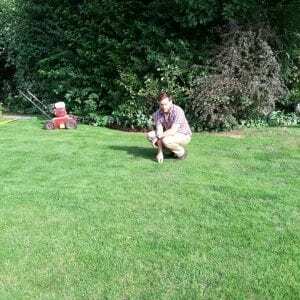 My name is Mark Fuller, I founded Lawn Crew with the focus to deliver the highest quality in lawn care and customer service throughout Surrey and nearby areas. We are based in West Byfleet and proud to be independent, Surrey born and based, lawn care professionals. Grass isn’t only the most resilient and adaptable plant in your garden, it forms your lawn – the canvas to which your garden flourishes from. We believe there is no such thing as ‘the perfect lawn’, instead we focus on helping our clients to achieve a lawn that is perfect for them – that’s why our services are tailor-made. Whether that’s a lawn that requires some TLC, a lawn that can cope with garden parties & BBQs throughout the warmer months, a lawn that can survive the family playing on it, or a lawn to look at. Whatever your requirements we can help you achieve a lawn perfect for you. We don’t offer lawn care packages or generic 5 step plans or ‘one size fits all’. our clients receive a tailored service that is bespoke to what their lawn requires based on their lawn requirements. We pride ourselves as lawn care professionals that produce tangible, excellent results for our clients and their lawns. We help our clients develop and maintain a lawn that is perfect for them, whilst providing exceptional customer service. As a professional lawn care company our objective is to help our clients achieve the lawn they desire by using high quality professional products and treating our clients’ lawns with top professional machines and equipment. Our mantra is that of combining years of hands-on experience, with the highest possible level of customer service.